The 81TWX humbucker pickup takes an EMG classic to a new level. The dual-mode design allows for maximum flexibility, with the original 81 guitar pickup providing all the crunch and aggressiveness it's famous for with an all-new single-coil that features a fatter tone with plenty of punch and clarity. Either mode is accessed through a push/pull pot for versatility. Dual internal preamps, one tuned for single-coil mode and the other for dual-coil mode, give the 81TWX guitar pickup two distinct sounds while delivering EMG's well known noise-cancelling technology in both modes. The EMG 81TWX humbucker and other pickups from the X-series provide increased headroom, giving the voicing an organic and open tone while still maintaining the clarity and response that EMGs are renowned for. 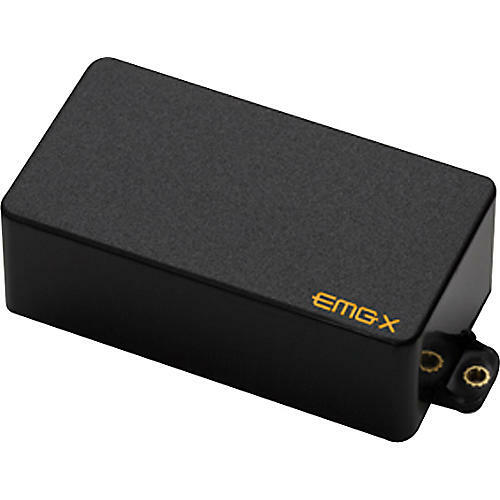 The EMG 81TWX pickups are best described as bridging the gap between passive and active tone. The EMG 81TWX humbucker package includes: EMG's exclusive Solderless Install System, a split shaft volume/tone control set, an output jack, a battery clip set, plus screws and springs. Note: standard EMG humbucker pickups are 0.9" thick. The 81TWX's thickness is 1.1", which is a difference of 0.22".